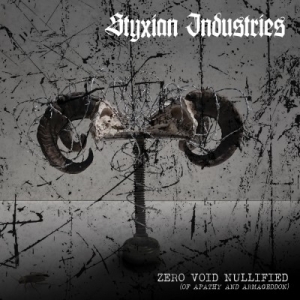 At the end of last decade, a new entity was born in the Netherlands: Styxian Industries. The aim was to destroy the last beliefs in mankind, and to brutally penetrate all organic structures by the post-apocalyptic industrial hammer (damn, I’m in a poetic mood tonight…). But seriously, this act created some stuff in between 2009 and 2010, with a highlight in 2012 by means of a split with Redreom, released via Total Death Records. More nastiness did follow in 2014 under the banner of The Last Generation, and I’m glad to announce that we can finally welcome the first full length studio album, which is called Zero Void Nullified (Of Apathy And Armageddon). Zero Void Nullified (Of Apathy And Armageddon), which has a total running time of fifty-three minutes, stands for an industrialised and mechanical form of (Post) Black Metal. There is quite some atmosphere that totally refers to the old styled trend anno early nineties. Riff-wise, I permanently hear those majestic structures that did characterise the Scandinavian scene specifically (and the trans-European more generally) two and a half decades ago. Gorgorothian guitar melodies (it includes the legendary Grieghallen-sound, for my concern!) and slow-paced mayhemic structures act as fundamental basics, but all this gets mercilessly raped by those machinery / factory electronics, covering the whole rather in a mist of industrial discordance.